FlyBosnia will take delivery of its second Airbus A319 aircraft towards the end of the month. Speaking to the "eKapija" portal, the carrier's CEO, Chris Gabriel, said, "The new aircraft will arrive at the end of April and will be operational very soon. In the coming months we will give details concerning the arrival of the third and fourth jet". FlyBosnia signed a deal for the acquisition of three Airbus A319 aircraft back in March, which will bring its fleet size to a total of four. "These aircraft will enable FlyBosnia to progressively expand its destination network as it builds up to a planned eight-member fleet by 2023", the company previously said. The airline currently operates a sixteen-year-old A319 jet from AerCap, which has so far been utilised on a number of special charters. Commenting on the delay in launching scheduled flights, Mr Gabriel said, "Due to the high demand for airport slots, as well as airspace congestion, the drafting of our schedule is taking longer than expected. However, we aim to commence revenue flights very soon. We will progressively announce our new routes via social media and our website". 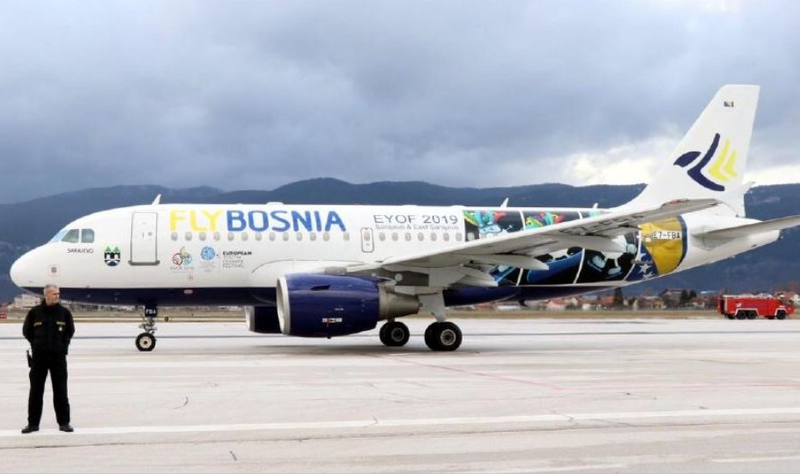 He added, "Our approach at FlyBosnia has always been the same - to link Bosnia and Herzegovina with nonstop flights on select routes in Europe and the Middle East where there is sufficient demand. The destinations in our first phase of expansion will be Riyadh, Jeddah, Kuwait, Bahrain, Beirut and Amman in the Middle East, as well as London, Frankfurt, Rome and Dublin in Europe. We will continue expanding our network as our fleet grows". The company will also operate charter flights which will cater for religious pilgrims visiting Mostar. The airline recently partnered with the Italian charter service provider SoleAir in order to run such flights. "A lot has been invested over the past few years to realise the dream of launching FlyBosnia and turning this idea into a reality. This includes direct and indirect investment, such as time and resources", Mr Gabriel noted. FlyBosnia has been set up by Saudi Arabia's Al Shiddi Group, which was founded in 1975 with interests in various fields, including construction, real estate, agriculture and tourism. It has been operating in Bosnia and Herzegovina since 2006. It is a tremendous success already. SJJ passenger numbers are going to explode. Congratulations to everyone involved! This could really be Sarajevo Airport's big break. This is the fifth version of their destinations they have announced. Every time they give a different list of destinations. This is the first time they mention Beirut and Amman and the first time they mention Dublin. Is there a market from Sarajevo to Dublin? They seem to have substituted Warsaw with Dublin. Maybe Dublin will operate from Mostar? A lot of croats from bosnia live in dublin, thanks to their croatian passports, maybe its for them. Something tells me that they will also start long-haul destinations adding a A330 similar to JU. I see it happening by 2023 like they say. Are there weight restrictions for widebody ac at SJJ? Turkish flies to Sarajevo from time to time with A330 and I don't think they have any restrictions. They will have almost the fleet the size of Montenegro Airlines by the end of the year. But route network is still 0. It's good to see them delivering on their promise about fleet expansion. Yea fleet that has no flights and routes at all. At $100-200K lease cost times number of months they had it in its possession with little to no revenue coming in the costs are mounting. I'm not even talking about other costs like wages, insurgence, SJJ charges etc. Something tells me that these people are amateurs and we all know what happens with such projects at the end unfortunately. Time to start flights already. Yes! They have been talking about "securing slots" for months now. Time to actually start flying. Other than London and Frankfurt are the other airports they plan to fly to really that slot restricted? Actually, you can even see on flightradar which slots they have secured. None of the cities they plan to fly to are served from SJJ. Why no Paris??? I don't get it. Same with Wizz avoiding Tuzla-Paris. Perhaps there isn't sufficient demand. Fleet of 4 is quite significant for a small start up. Congratulations. Who will be affected most by the launch of FlyBosnia? Umm, their customers? Go figure! Sarajevo will be the quiet achiever airport. Great success with no fuss and flaunting similar to other airports. Prestige is achieved with style and not much noise. One word: Well done BiH. Before praising your own cow, could you not mention and belittle your neighbors'? Also, could you wait before they actually start the operations? Haters gonna hate. Flights will begin. Did you even read the previous FlyBosnia reports? Don't think so. It's not a matter of belittling. Perhaps you can speak to your fellow countrymen and advise them not to cheer and hail everyday. The excessive flaunt is sometimes outrageous. If anyone is a hater here, the word you like to throw around oh so easily - us you. Where is the hate in my post? Point it out. Calling out other airports out of theblue and then pack it like you're speaking the fact is belittling and trashing. Stop playing dumb and innocent. Will they purchase the planes or will they be on a dry-lease? It will be dry. No doubt about it. I hope it doesn't end up like Air Albania, which got one plane from Turkish which was returned after a few weeks. Air Albania has already a IATA and ICAO code. The flights to Istanbul are due to start the last week of April/1st week of May. I have never seen an airline that is constantly taking delivery of planes but has no flights. Sarajevo needs more flights to western capitals. There is a market and potential. Despite the number of flights from the Middle East to Sarajevo, there is obviously pent up demand. This is correct. Yesterday was an extremely busy day apparently. They should be on my opinion or simply promoting the airline domestically. I wonder what the fares will be like? Will Fly Bosnia be a full fare, hybrid or low cost airline? I doubt low cost since they have a business class.